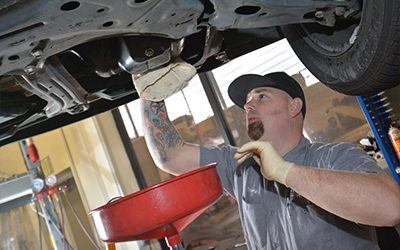 Getting the most out of your vehicle means committing to take care of it by providing frequent maintenance. Bringing your car to an auto repair shop on a semi-regular basis will help you to get the most miles out of your vehicle, and will help keep your engine healthy. Of course, there are many things you can do on your own that will help you keep your engine healthy as well, but when it comes to oil changes, brake repairs, or changing belts, you might want to leave it to the professionals if you don’t have prior knowledge in car repair. One of the repairs you should be tending to on a somewhat frequent basis is getting a belt replacement. There are two major belts that need replacing, and that’s your serpentine belt and your timing belt. For now, we are going to focus on what your timing belt does, and when it should be changed and why. Your timing belt does exactly what it sounds like: It makes sure that your shafts (crankshaft and camshaft) are turning at the proper rate, and depending upon the make, they also control the timing of the water pump, oil pump, and injection pump. Without the timing belt, the timing of these components won’t allow exhaust and fuel to pump in and out of the engine correctly, resulting in a dysfunctional car. You’ll generally hear a high-pitched, screeching sound as your turn on your car, but it’s no longer considered a full-proof indicator that you can depend on. It’s recommended that you get a new timing belt every 60,000 miles, and with new makes and models, you can extend that to 100,000 miles. If you notice an abnormal vibration coming from your engine, a loss of power, or a dip in your fuel economy, contact our auto repair in Folsom. We would be happy to provide you with a timing belt replacement or any car service that your vehicle may need. Call us today!